On a weight loss diet? Enjoy Blissful Wellness high protein deserts. 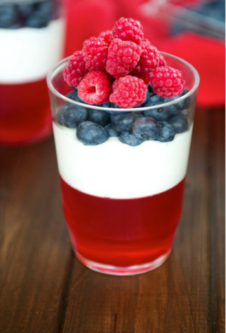 Red White and Blue — anytime weight loss for you! Prepare Blissful Wellness Raspberry Jell-O as directed on each individual package, depending on how many servings you want to make. Place each packet of premade Jell-O mix into clear plastic cups, leaving space to add the pudding later. Add pieces of Raspberries into the Jell-O and let cook in the refrigerator for 1-2 hours. Once the Jell-O is solid, top each one off with your premade vanilla pudding. Finally, sprinkle a few blueberries on top to finish off this delicious treat!